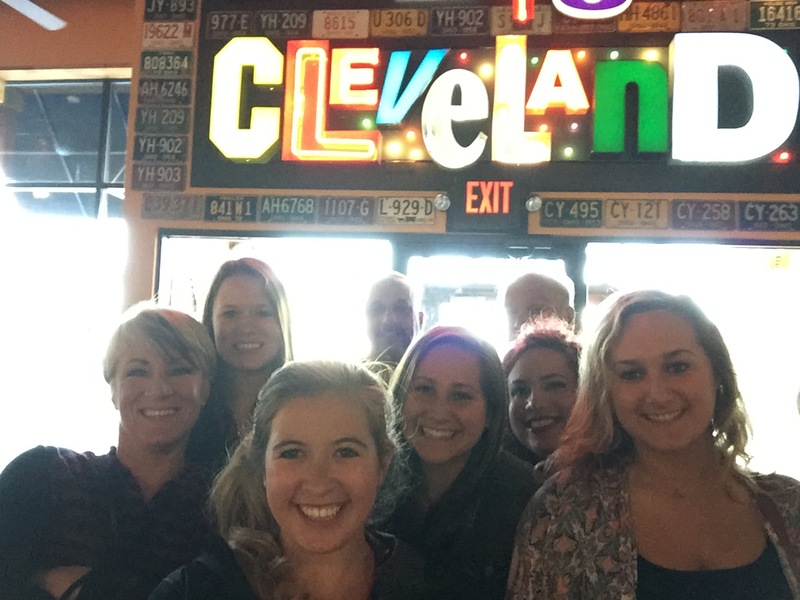 The past week I have spent time in a number of different cities – 4 to be exact. 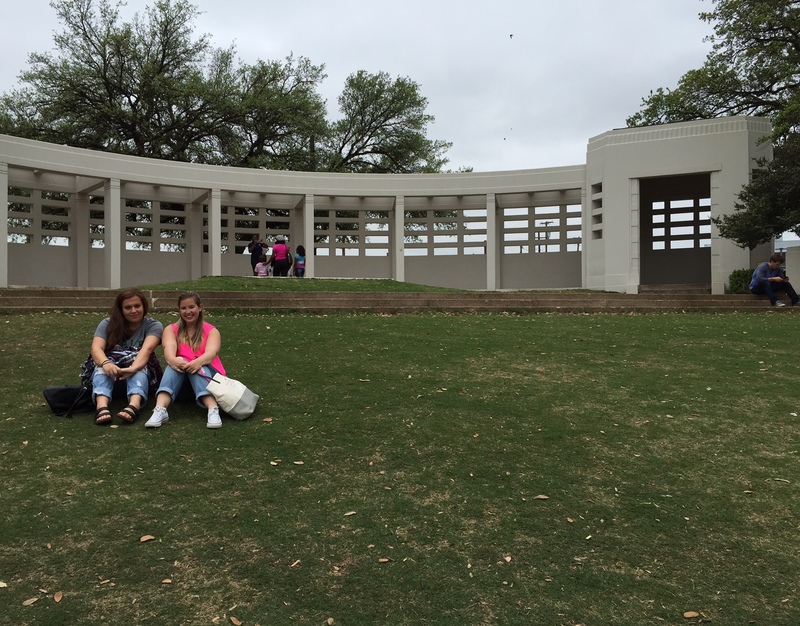 Last weekend I travelled down to Texas with two of the other exchange students to see what the South had to offer. With that I had now covered multiple parts in each of the coordinates of America – North, South, East and West – so I feel as though this semester has really allowed me to get to know America that much better. I spent the week in DC of course for classes, etc and then at 3am on Saturday morning travelled to Ohio to visit a friend for the night. It’s been a pretty crazy week! 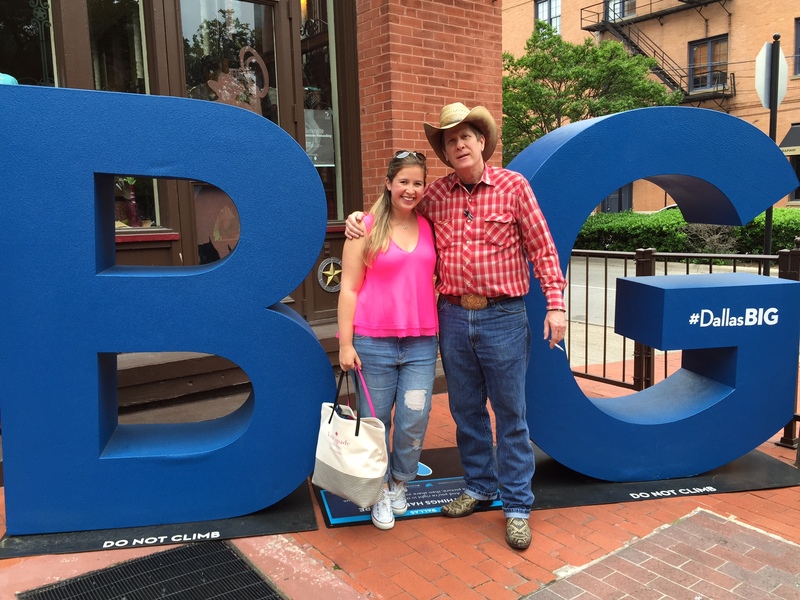 So let me start with Texas – what an experience! Firstly, I would highly recommend a trip there – we had such a good time! So don’t let people turn you off it with their consistent asking ‘why are you going to Texas?’ – there is heaps to see there and much of it is really pretty. I would totally go back on a future trip! We visited Dallas and Austin making it a whirlwind of a weekend that involved a lot of travelling but that was definitely worth it. 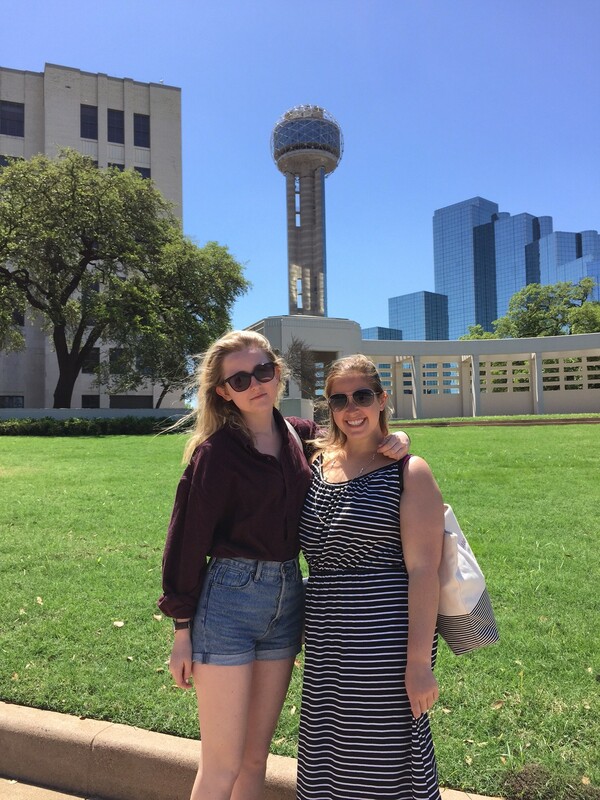 We headed on down from DC to Dallas after class on Thursday and spent Friday exploring the city – especially everything that was JFK related as, in case anyone doesn’t know, that is where the president was assassinated in 1963. Accordingly, Dallas has been recovering from its reputation as the ‘city of hate’ since then but despite the horrible history that is well documented on Elm Street, really the southern chivalry is super evident in Texas – cowboys are very gentlemanly! We spent most of our first day in Dallas inside the 6th Floor Museum which is in the Book Depository building where Oswald allegedly shot from. For anyone visiting Dallas I would say that missing this museum would be a big mistake – it is so interesting and so well documented – it’s really a great museum! 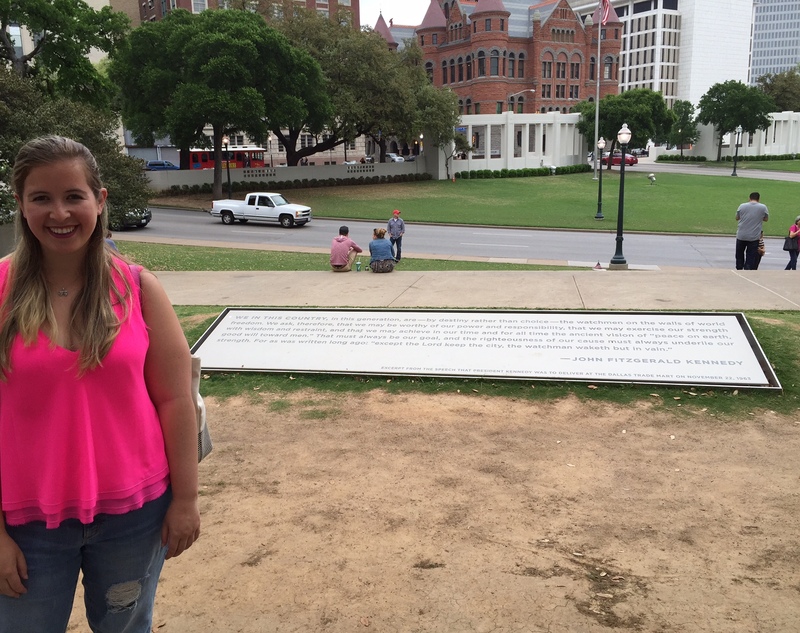 We also went to the Grassy Knoll and stood on the exact spot of the road – which is marked off – that he was shot on. For a modern history lover and someone who is very interested in conspiracy theories like myself, this was a fantastic day, albeit based on a very saddening experience. The museum captures the sadness that was felt not only across the nation, but across the globe, really beautifully but also shows the build up to the event, and the bizarre series of events that followed. As I said, this museum is not to be missed when visiting Dallas. We spent time on a historic street nearby where we had Mexican for lunch. Texas is apparently known for its Mexican food which I found strange at first, but later I learnt that Tex-Mex was invented in Dallas and so it made a bit more sense. Dallas apparently is also responsible for the inventions of 7/11, Dr Pepper, Lays Chips, Neiman Marcus, the Micro Chip, and so much more. Kind of crazy to think that all of that came from one, semi-random city! That night we took the bus from Dallas to Austin which is just over a three hour trip. I have a friend who lives there who we stayed with for the night and who gave us a pretty great tour of Austin, starting with the bar scene that evening and a look at 6th Street which is a crazy part of town! We went to a couple places and saw some live music which was on our list of things to do in Austin. We also saw a bar with a mechanical bull so all-in-all we were definitely feeling like our experience was very Texan! My friend managed to raise that bar the next day when she took us out of Austin to this barbeque restaurant called Salt-Lick that was just about as Texan as it comes. It was fun to see and though we couldn’t get through a third of the enormous portions of food presented, it was definitely tasty. From there we went to my friend’s ranch to enjoy some of the amazing natural aspects of Austin – the property was absolutely gorgeous and we had a good time walking through the river and driving the golf buggy around the grounds. Once back in the city we drove through some streets that looked quintessentially Austin – it’s a very eclectic city! We enjoyed a stop at the Capitol building because its really gorgeous and looks similar(ish) to the DC one but minus the scaffolding. 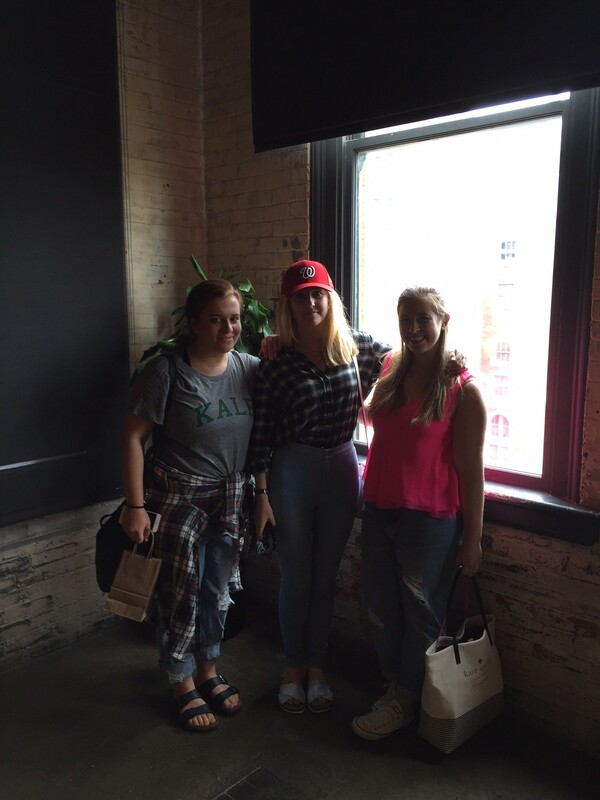 That afternoon she took us to a place that had a vintage market and, again, really emphasized the ‘indy’ atmosphere of the whole city. 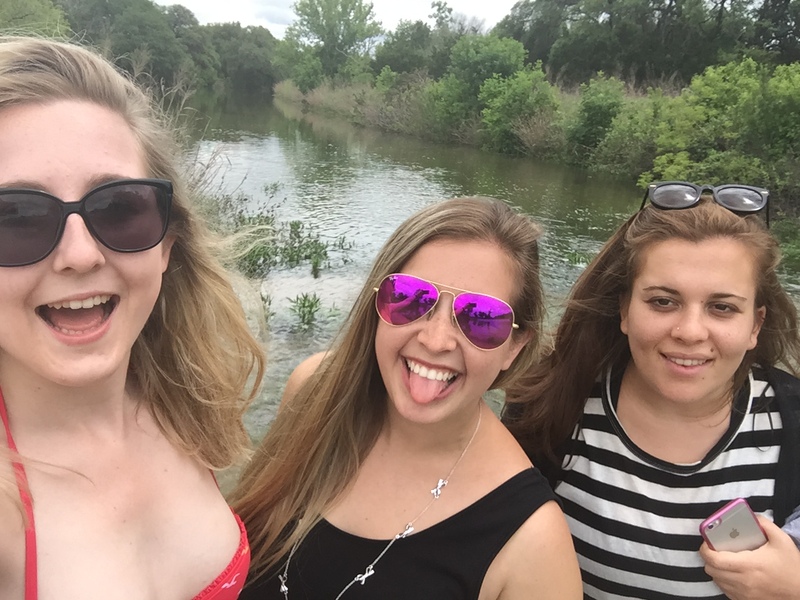 Austin was definitely an experience and I will definitely go back some day! That night there was a freak rainstorm to end all storms – it was crazy – and unfortunately it occurred right when we had to go to the bus to head back to Dallas so we got on the bus soaking wet – less than ideal! We got back to Dallas at like 1:30am so we just went to bed so that we could explore the rest of Dallas the next day. We began our last day in Texas with a trolley tour of the city which was a great way to see more than just the area in which we were staying and also to learn some interesting facts about Dallas and its history (including that they invented all the things I listed above). 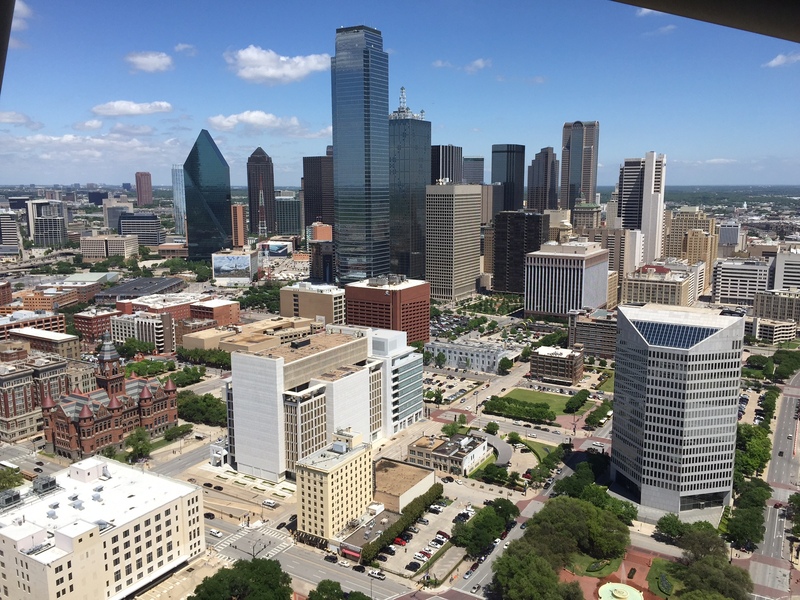 We went up to the top of Reunion Tower where we enjoyed 360 degree views of Dallas – it’s really quite a pretty city – lots of interesting architecture! From there we went to see the last few monuments we wanted to see before finishing off with dinner in the same historic district we had lunch at the first day – this time more authentic Southern food though. Unfortunately, with that we had to head to the airport and our time in Texas came to an end. It was definitely an interesting weekend full of new experiences and I’m really glad we got to enjoy them! 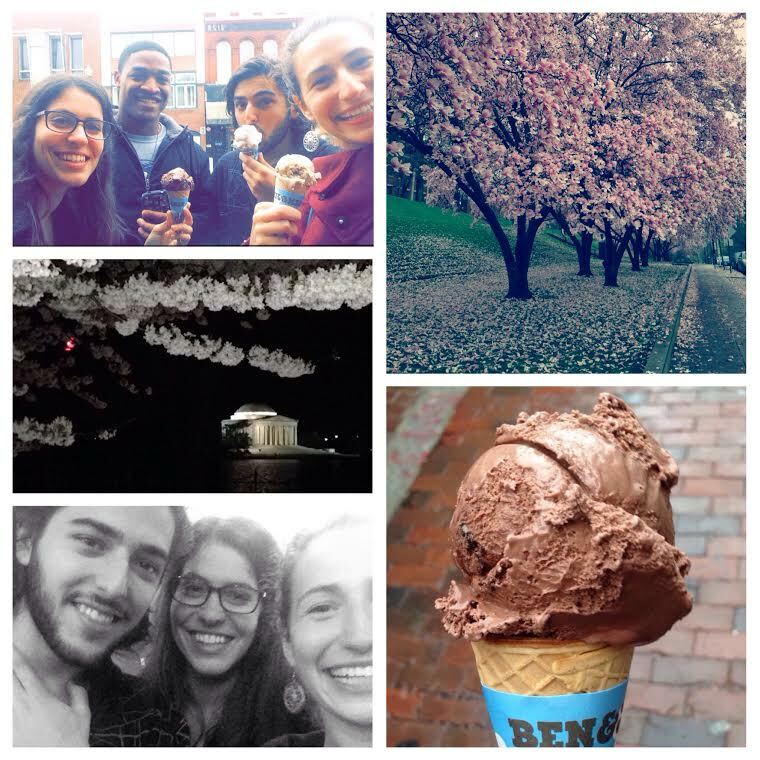 From there it was back to DC and back to a number of assignments for all of us! On Friday night we had our exchange farewell dinner (although we are still here for a number of weeks, this is the last week I suppose before everyone gets really busy with finals) hosted at the Australian embassy by the Study Abroad Office. It was nice to see everyone again – obviously with 50 something of us here we weren’t all going to hang out every day and so everyone broke off into smaller groups – it was great to all reunite for one big final event. We had superlative awards that we had to vote for (including Exchange King and Queen), a trivia game that reunited us with our Orientation Week groups (and which my group won – yay! ), some drinks and some nibbles – it was all a lot of fun although it is very sad to think of this experience coming to an end! I’m not going to talk about that until next week’s blog though – but I will say I definitely am not anywhere near ready for it to finish – it goes so quickly! Because of the event on Friday night, I changed flights that I had booked to go to visit my friend and her family in Ohio for the weekend and so at 3:30am on Saturday morning I headed to the airport to make my way to Cleveland, via Chicago. It made for a very long day (we all went out after the dinner and so I managed to squeeze in a one hour nap between 2 and 3am but that was it) but it was so lovely to visit my friend that it was worth it – and I’m really glad that I didn’t miss the Friday night event! I would have been really disappointed if I hadn’t had a chance to say goodbye to everyone!! Ohio is definitely not on every tourists’ list of things to do in America but spending time with my friend and her family was a lot of fun and it was nice to have a little feeling of home – even if only for a night. They were so sweet and I had such a great time seeing them! This time we also explored a bit more of Cleveland (they live an hour outside of the city so I didn’t really see Cleveland much last time I was in Ohio), so this morning we went to Little Italy and to the Cleveland Art Museum which, if you’re ever in Ohio, I would highly recommend – it’s a really beautiful museum! We had lunch with the whole family again at this crazy grilled cheese restaurant that had the biggest sandwiches I have ever seen in my life! It was insane! Although a quick trip – it was definitely a good one! And so now, having just returned from the airport, I’m sitting down to what I’m positive will be a very late night of studying – finals are definitely approaching! Filed under Uncategorized and tagged Carly |	Comments Off on A Very Busy Week! When you do a balance in your life between stress and fun, both things tend to be better; you do not stress in excess and enjoy the fun even more. I think this week was the last one that gave me the possibility of saying that. My following weeks would be all about essays, presentations and final exams so there would definitely not be any balance. Anyway, last week started and ended with special activities that I’m really happy I experienced. Not being all of those happy, I could also appreciate and make the most of it. It was raining when I woke up on Tuesday morning but nothing was going to keep me from enjoying the “free cone day” at Ben and Jerry’s. After one of my classes in the afternoon, I decided that I wanted to walk to the store at Georgetown but it was going to be more fun if someone joined me. After a contagious laugh of my roommate, I decided that I needed to ask someone as crazy as me to walk 25minutes under the rain for some ice cream (that I already had in my fridge…) But there is no better feeling than getting something for free, is it? Thursday was a really important day for the Jewish community. I would like to say for the rest of the world as well but unfortunately I can’t. On Thursday we commemorated the victims of the Nazis, we remembered the 6 million Jews that were tortured until their last breathe, we remember to not let it happen again. That day I attended two important events that left new ideas in my mind. Even if I studied history and the Holocaust since I was a little kid, I still heard something that I never thought about before. Six Million. How do we measure 6 million of anything? Students of GW organized the first event and I got the chance to meet one of the survivors of the horror. Gideon Frieder used to be a professor at GW and he shared with all of us some of the things he went through at that time. Of course his history was not a pleasure to hear even if it was a pleasure to have the opportunity of listening at it first hand. I did hear him talk about the six million and the way he tried to explain us how much that represented shocked me in a different way. “Imagine that each of the victims come to this meeting right now to say their names and how they died in a minute”, he said. “That each person has only one minute to talk and right after that they vanish and other victim follows. Do you know how much time do we need until the last victim shows up? 2? 3 years maybe?” Eleven. 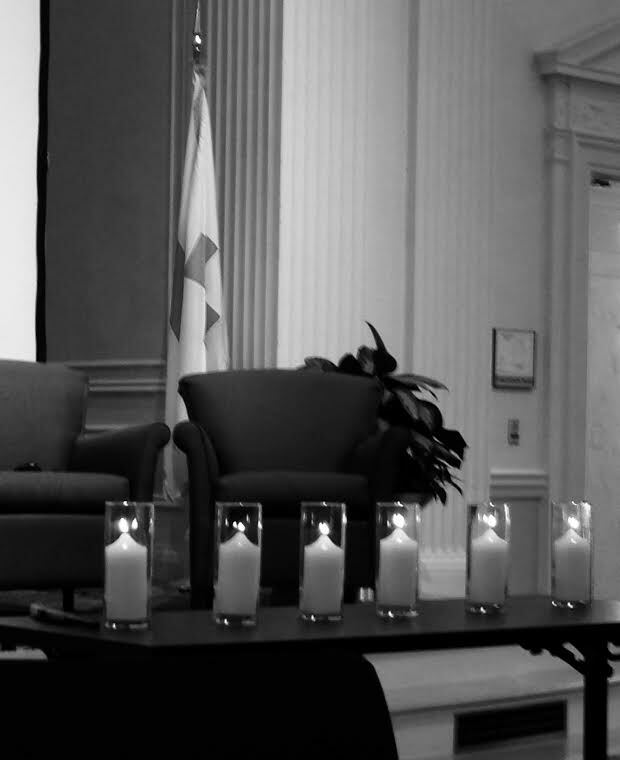 Eleven years without stopping to listen to the 6 million victims of the Holocaust. And they weren’t the only victims they were only Jews. How much time would we need to listen to all of them? I always tried to measure 6 million. I guess I may have found the same answer a few years ago but never replaced a minute with a name. It was always something abstract (is still is, is not easy to determine) but the idea of not moving myself from that chair not even for water and still needing 11 years to just listen to names, not stories or feelings, just names made me think about it in a completely different way. The second event was in the Red Cross building. The room was full of pictures of the camps or newspapers of that time and there were people from the state department and relatives of a few survivors. A speech of a Rabbi, a video with reflections and legacies from 90 years old survivors, a panel discussion and candle lighting ceremony. This event was different and also touching. Remember. Remember to not let this happen again. Yom Hashoah. We Remember and Never forget. My week ended with a happiest feeling. 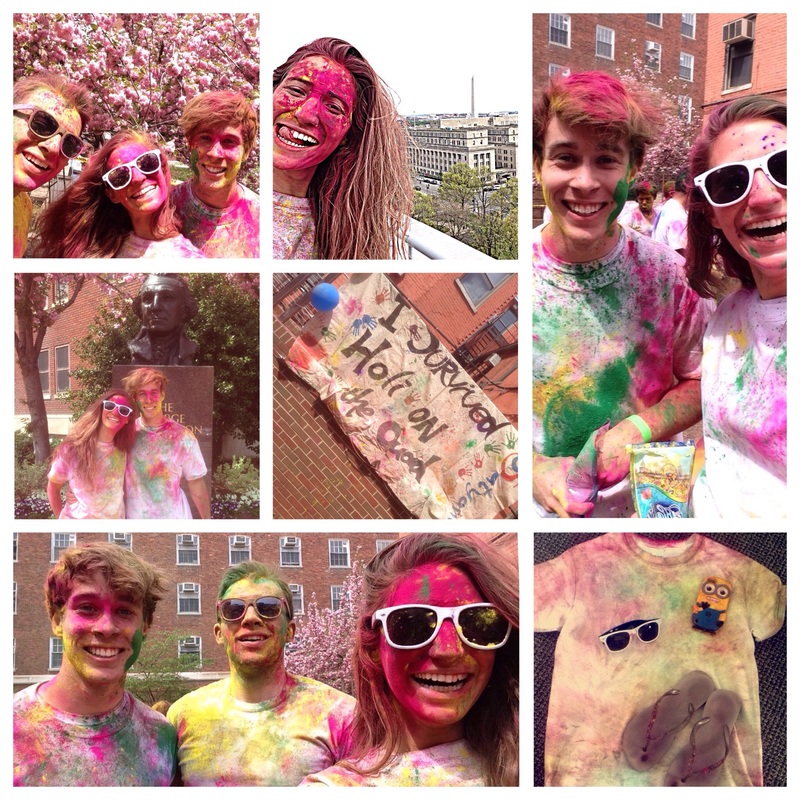 On Sunday afternoon I went to the event organized by the GW Hindu Students Association “HAS Holi 2015” This festival of colors that celebrates life gave me the energy I was looking for to start my last two weeks at this University. The idea of the event is to have fun with friends, listen to music and get covered by colors celebrating love and “the power of love to bring all good things into our lives. It is held in early spring and signifies new life, new growth, new beginnings and reminds us to color our life with love, faith, and a generous spirit.” That’s exactly how I felt. I went with my friend Christian and we met there a lot of new people, we laughed and enjoyed each minute of it. It was a nice way to end the weekend even though that after one hour bath, my hair is still pink. But I don’t mind. It will make me remember about the fun and energy I felt. It’ll make me remember that even though we are leaving in three weeks, a new beginning would come after and what’s most important, that the last couple of months I lived, I colored, my life with too much love. The Blossoms are in Bloom! Spring really is a magical time to be in DC! The whole city seemingly glows in the sun and the green grass is finally uncovered from beneath the blanket of snow that seemed to hide it since I arrived in January. Even the fact that the fountains at the WWII memorial are on now totally changes the appearance of the national mall. All of these factors and more contribute to what really is a stunning picture-perfect city right at your doorstep whilst here at GW. And whilst all these things make the city that much more special, really it is not why spring-time in DC is famous nationwide. For those who do not yet know (and if you come in the spring semester you will quickly find out as the National Mall goes from being a bit of a ghost town in the winter to an area buzzing with activity and tourists in the Spring), this season seemingly calls on a mass migration to the nation’s capital. The main star of the attraction are the cherry blossoms that dominate the area with beautiful pink leaves everywhere. Seeing these cherry blossoms is a treat as they are only perfectly in bloom for about a week a year, so you really have to make sure not to miss them! The Cherry Blossom trees were a gift from the Japanese to DC in 1912 and it was Mayor Yukio Ozaki of Tokyo who proudly gifted them. Since then, late March/early April has become known as the time of the National Cherry Blossom Festival which I believe has gradually grown into the event that it is today. Having been away for a week I was worried about the prospect of maybe missing the Cherry Blossoms and having seen them before on a trip to Japan, I knew that missing them and their beauty would be a big loss. Apparently, the cherry blossoms heard my concerns and waited for me to return before blooming into full glory. Thank you cherry blossoms! So after a red eye flight and no sleep all night, I got in from the airport, dumped by bags and met up with my friends to head straight on down to Constitution Avenue to get a good spot along the Cherry Blossom Parade route – a large parade that goes nearly all the way down Constitution Ave to mark the closing of the festival. Because of the really cold winter we had, the closing ceremony seemed somewhat premature because it was only then that the blossoms bloomed but never mind, the thought was there. We got a spot right opposite the Washington Monument and had the White House directly behind us – couldn’t have been in a more picture-perfect/’guess what we are in DC’ position if we tried! 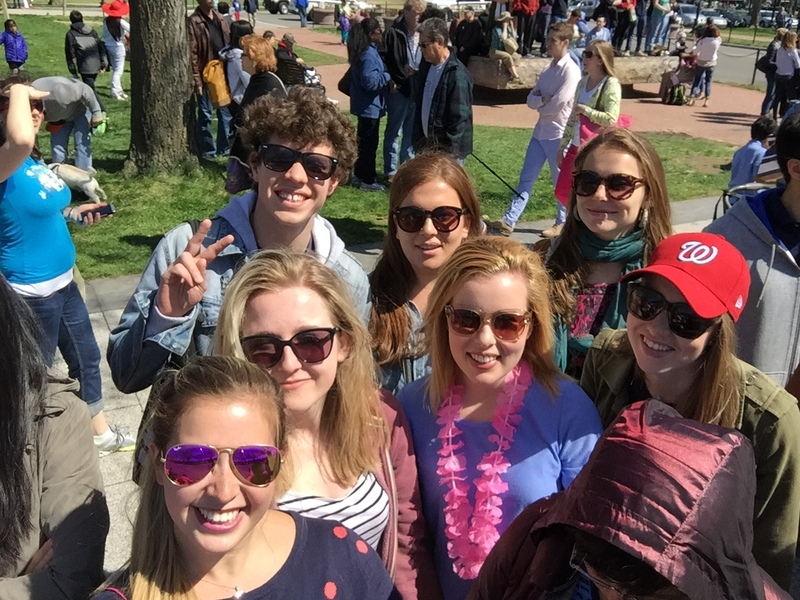 We were very lucky because the sun was out to play that day and the weather was amazing and warm – ahhh, I like this DC! The parade itself was 2 hours long and was pretty interesting – there were a number of marching bands, a series of different middle and high school groups and activity clubs that showed off their skills including unicycling, girl scouts, etc, some artists including Estelle who performed, various military marching troops, etc. 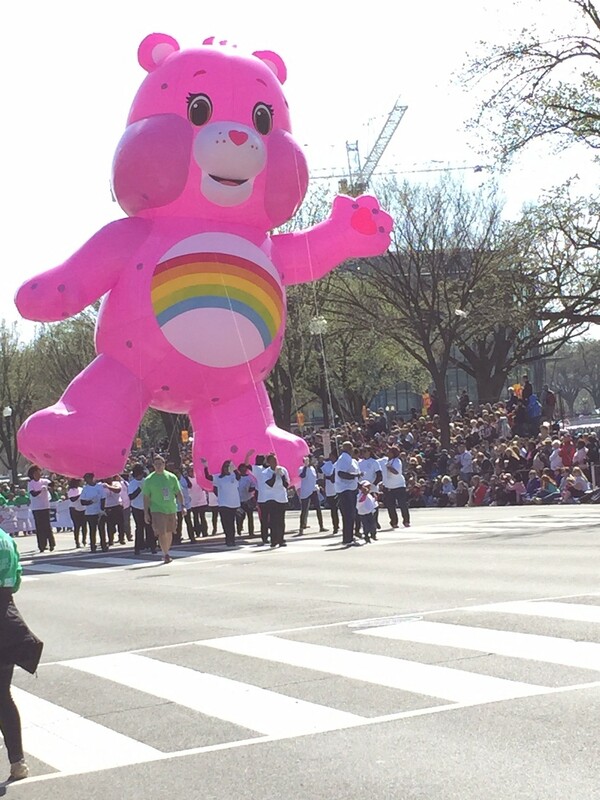 It was a nice parade and we all enjoyed it. 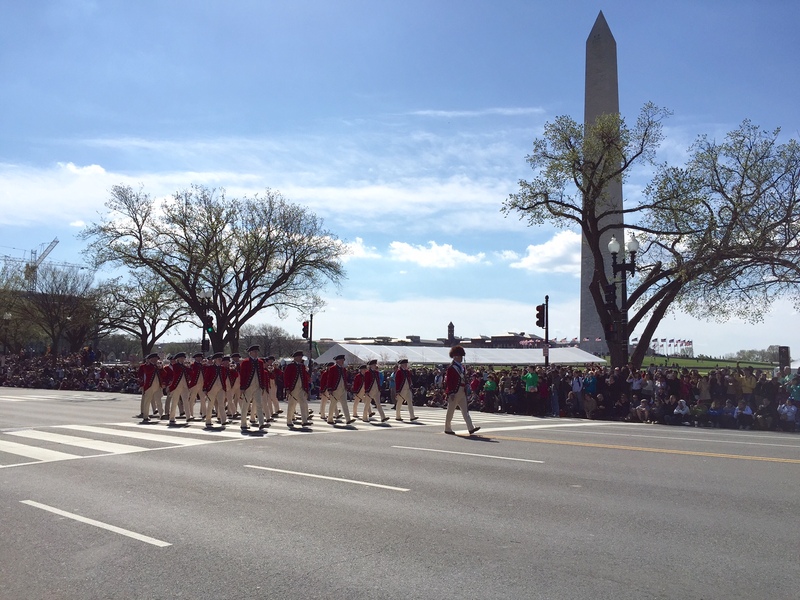 I particularly enjoyed watching the crowd cheer and praise their military whenever the parade showcased different men and women in service, which is systematically did throughout – it is fantastic that there is such pride in and support of people who dedicate so much. After the parade we decided to take a walk down to the Tidal Basin to have a look at the cherry blossoms and snap that cliché yet gorgeous photo of the Cherry Blossoms in front of the Jefferson. It was absolutely stunning down there although it was much to crowded as every tourist and their dog seemed to have moved from the parade trail down to the Tidal Basin with us – we did expect this to happen, but nonetheless. We decided to leave the area after that return during the week when hopefully the crowds had died down a bit. 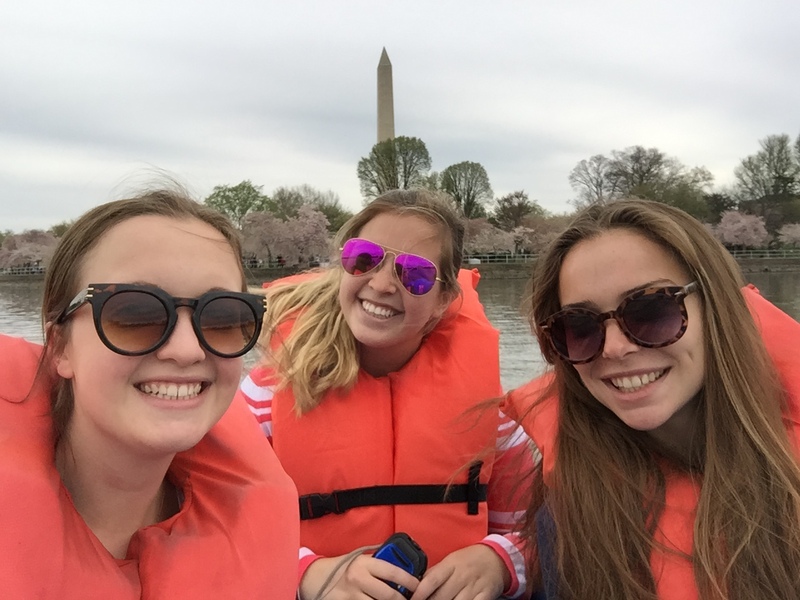 And that we did – I went back on Monday morning with two of my friends who are also exchange students to go for a nice stroll along the mall and back to the Tidal Basin. The crowds were definitely less which was fantastic and we took total opportunity to snap a few more photos with the blossoms. 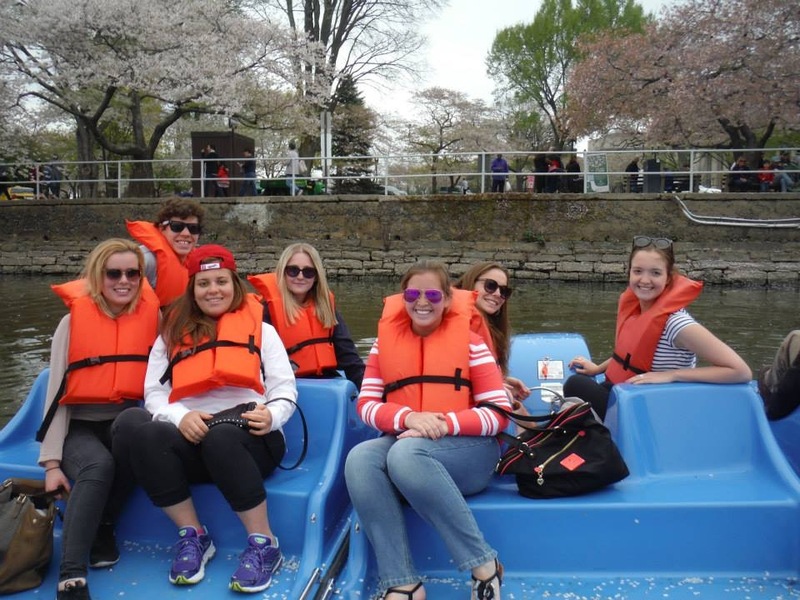 The Cherry Blossom excitement is infectious here though and so despite surely having had my time with the trees, when the sun came back out on Wednesday 6 of the exchange students and I made our way down to the Tidal Basin again but this time to go paddle boating. It was a lot of fun! 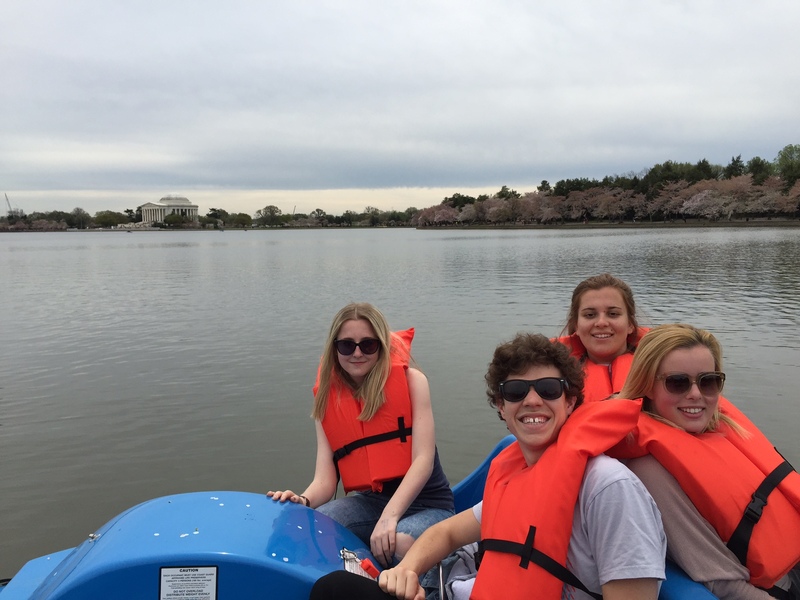 We got two four seater paddle boats between us, put some music on full blast on our phones and tried to keep the two boats as close together as possible whilst paddling around the basin checking out all of the monuments. What a gorgeous view! For anyone coming here in the Spring, I would definitely recommend this as an activity that should be done! And good luck switching drivers – we were so impressed with ourselves when we didn’t fall in! All in all, to future Spring students, get excited! DC is absolutely stunning – it was in the winter too but now it is as if there is boundless energy and life seeping from the monuments and amazing nature around. I’m sure I say this every week but wow – what a city! Cant believe our time here is slowly approaching its conclusion – leaving is going to be very very difficult! But anyway, there are a couple weeks still before that becomes of concern. 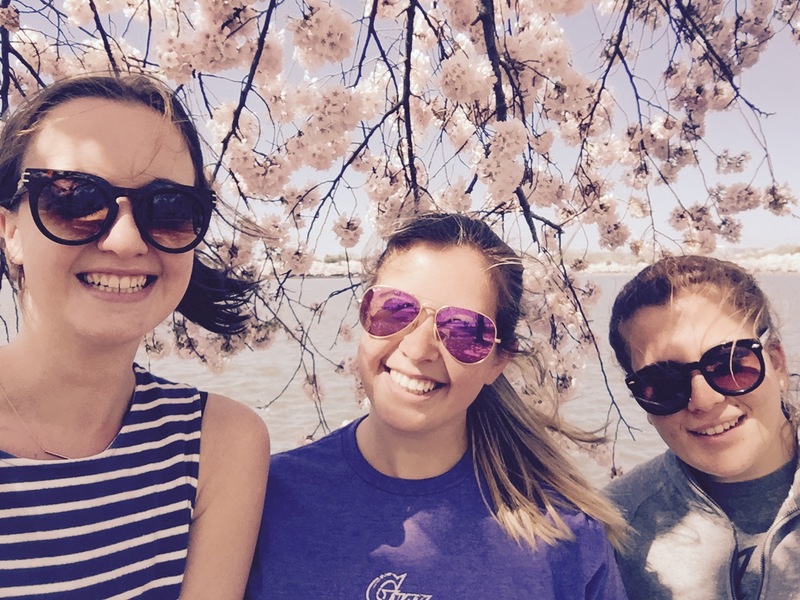 Filed under Uncategorized and tagged Carly, DC, GW, Learning @ GW, Life @ GW, Living @ GW, Washington |	Comments Off on The Blossoms are in Bloom! This is not the way I expected this week’s post to be. But sometimes your idea just change for some special occurrence and its necessary to use the space you have to express yourself while you can. This week I got the chance to attend a Baseball game with my friends, to see the famous Mets live and eat some hot dog and beer like in the movies. 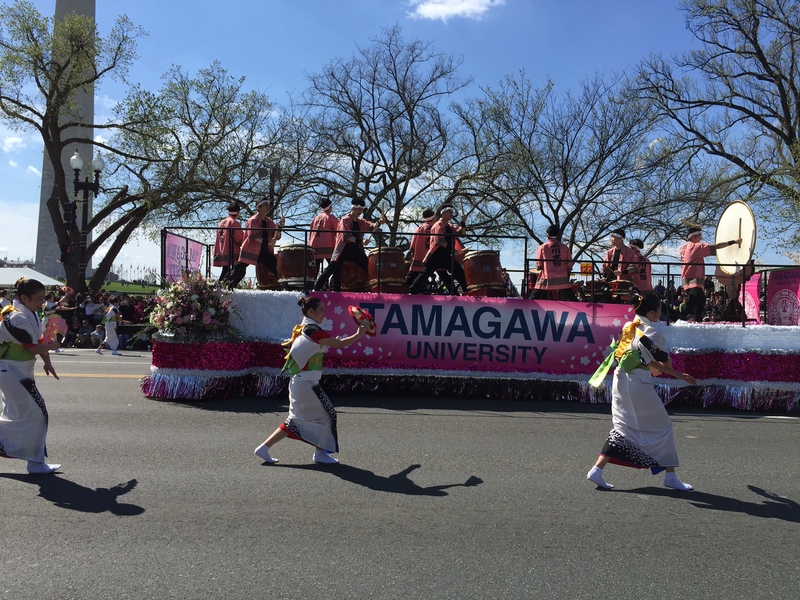 This weekend I also attend the famous National Cherry Blossom festival and parade where all this fantastic performances took place. 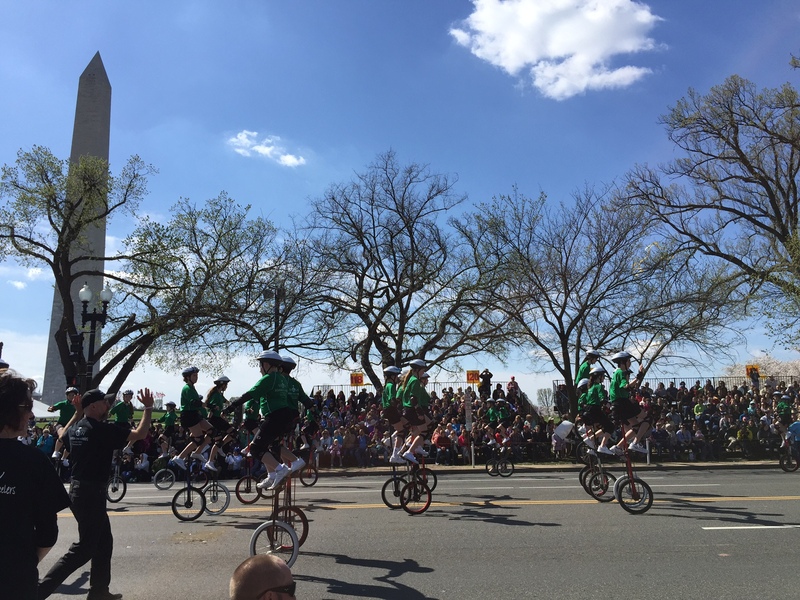 School bands, cheerleaders, Miss America, martial arts performances, the gigantic flowers and kids using one-wheel bikes. Most of those impressed me so much that together with the wonderful weather gave me this feeling of why DC was so marvelous. The whole city was outside wearing costumes (or not), enjoying the parade and taking pictures all the time. The million people were finally enjoying their walks around the monuments instead of escaping from the snow or cold weather like the last couple of months. Both events let me enjoy the American life and spend time with my friends while learning from these traditions. Even though I found special characteristics on each that took my attention, nothing made me open my eyes that much like what happened at the end of the week. The thing that shocked me the most happened Sunday evening when after a really long day of study, movies with friends and dinner with my brother, I came back home to discover that half of my room was now, empty. My roommate just moved out and the only reaction that my body had was tears. Not because I was going to miss her because she is still going to spend time with me, but because the idea of leaving reminded me that I am three weeks away of doing exactly the same that she did. The only difference is that for me, leaving means “forever”. I’m exactly 3 weeks away from packing all my things that would have to fit in two suitcases (no idea how am I going to do that) and go back home. I know I won’t be back the same way I came, not only for the uncountable people that touched my heart and I would definitely miss but also for all the adventures and experiences from which I learned while leaving here. This indescribable feeling that I have right now, the mix of joy and sadness, the pain in my head and the happiness in my heart, my throat closing but my soul more brighter than ever also reminded me the reason I came here for. What I expected this trip to be like and how it finally was (pretty similar I must say). But Is not that I didn’t know that the day were the experience reach its end was eventually going to come. Or that I haven’t left people or a place where I’m comfortable in before, it’s just the desire of being here at GW longer. I have never been good for goodbyes. After 3 months I assumed as normal some things that apparently, were not. My kitchen utensils, my bathroom curtains, the flag on the living room and even half of a closet. If anyone ever tells you that moving out and leaving things behind is easy, don’t believe it. They would be absolutely lying. Yes, everyone survives but it’s just not the best feeling. There are people that understands that life is this way, that you run into persons that would mean something, that you would learn only from some of them and that just a few would stay for a while but no one would stay “forever”. There are people that comprehend that you would see again only the people you care about and for the rest of them, well, there would always be Facebook. There are people that believe in destiny and that you would see someone again if it’s written. There are people that understand that knowing you means taking something from you at the same time that they are giving you something from them. And I believe that that’s the way they stay forever. I knew a lot of people here in DC. I shared most of my adventures, nightclubs, study nights, walks around campus, museums, lunch or dinner time, shopping and even taxi rides with persons that shared with me who they are and let me share with them who I am. They took something from me and I have something from them (mostly their pictures.. :)). I don’t regret meeting people that I am going to miss and I don’t regret meeting persons that became my friends. I don’t regret at all but now? Now I just want to hug them as much as possible. I got the chance to know them and I may or may not see them again. The good part? I have them in my heart FOREVER. 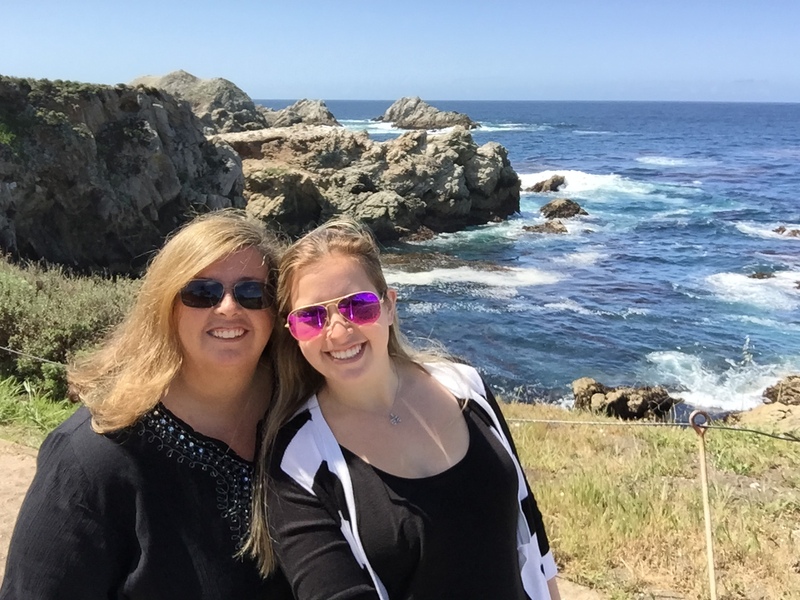 This week brought on an adventure very different to my previous weekend travels as my mum (who was here visiting from Australia – in case you missed the last blog) and I went on a road trip down the Californian coast on the famous Highway 1. It was absolutely stunning (as I hope you will be able to see in the photos included) and we had a really fantastic time travelling together! In order to make the most of our trip I took the week off school – I’m not entirely sure that I’m allowed to post that in this blog but I will say that in order to take the week off I planned for it the entire semester. I told my professors in Week 2 and reminded them again more recently, I asked them what extra work I could do for them to excuse my absence and I made sure that my attendance record throughout the entire semester was perfect until this week. I think that (whilst I’m sure I’m not meant to promote this) taking a week off is definitely doable as long as you are fair on your professors in the way you go about it before. As our grades are all pass/fail offering the extra work was not to keep my grades from being altered but instead to show respect to the professor and an acknowledgement that you are missing a class that they worked to prepare. Perhaps it is a step you don’t have to take but I would encourage that you do – the extra work that I am doing is so minimal that it was totally worth maintaining a good relationship with my professors. I’m really glad though that I took the week off – it was so worth it as it gave me an amazing opportunity to see America from the road – and wow, is it gorgeous! 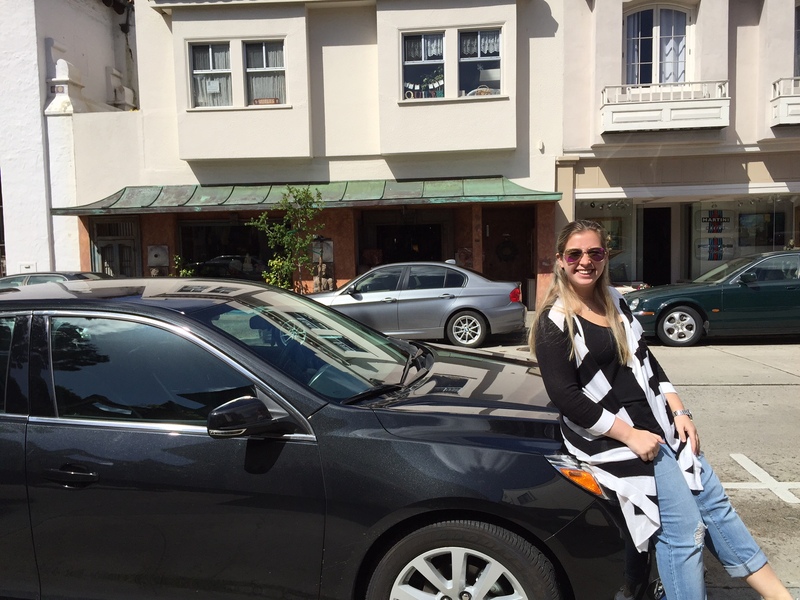 We began our road trip in San Francisco – being from Australia, driving in America means driving on the wrong side of the road and the wrong side of the car – my poor mum! 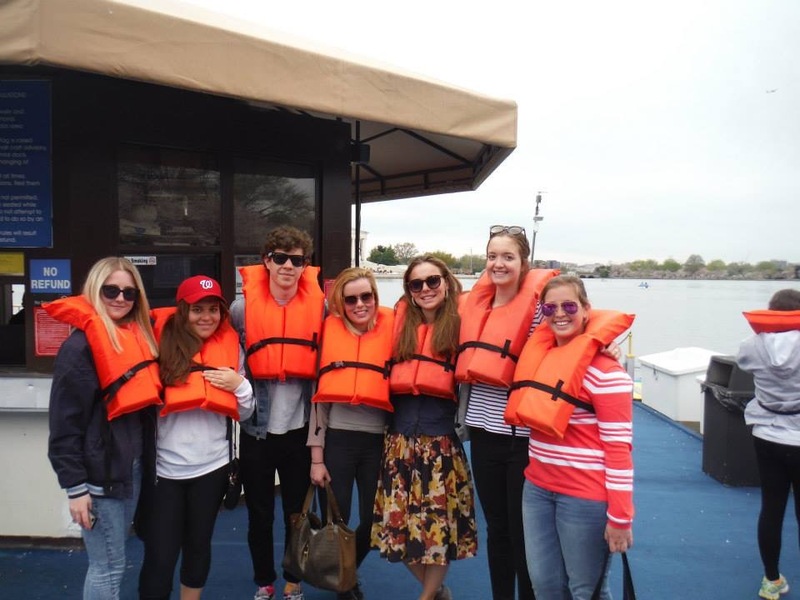 It is important to note that many exchange students may find taking a road trip to be somewhat of an impossibility as you have to be over 25 for nearly – if not all – the car rental companies to rent to you. 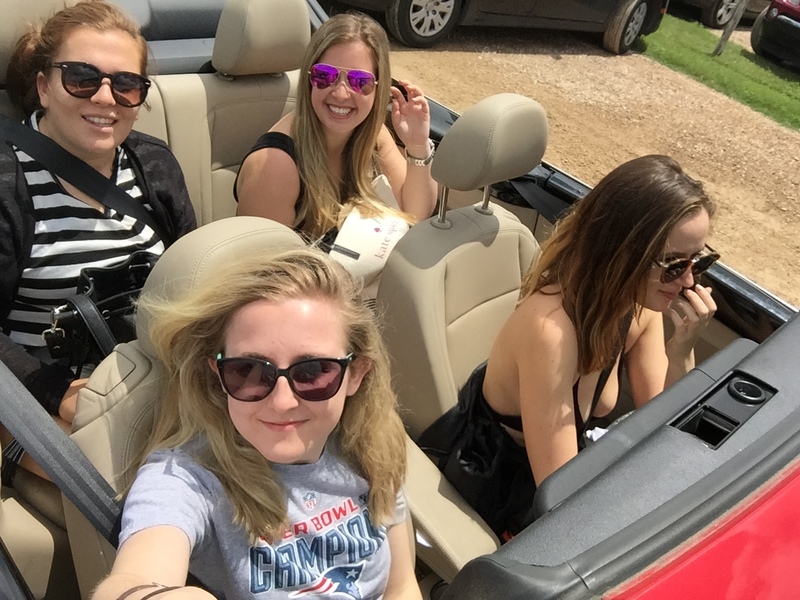 If you are 25 though, we rented from National Car Rentals and I would highly recommend them – they were so easy, well-priced and the car was great. San Francisco is a really pretty city and having not visited there since I was 6, I was really glad to go back and see some of the main sites. Unfortunately we didn’t have much time there and it really was just the main sites we got to see, however, I have plans to go back after the semester ends and so I will explore more then. This time it was mainly about seeing family and having a little reunion with my cousins who live there who we obviously don’t get to see all that often. It was fantastic to see them all and seeing the Golden Gate Bridge was exciting as it is really a gorgeous bridge and we drove down the insanely steep and curvey Lombard Street which was a bit of an achievement in itself! Yay Mum! 🙂 We briefly saw the Fishermen’s Wharf and looked out at Alcatraz – I definitely have a long list of things I want to do next month but I think we did pretty well considering we only had one night there! On Tuesday – after breakfast with a cousin and our San Fran road exploration we began the road trip part of our trip and headed south towards our first stop – Santa Cruz – where we spent the afternoon. 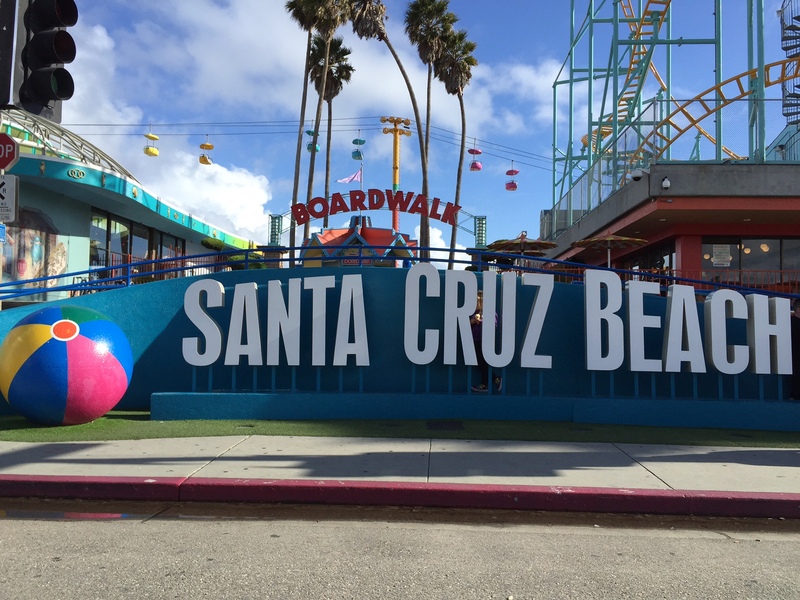 Being the big kids that we are, we wanted to stop in Santa Cruz to hang out at the Boardwalk – a sea-side amusement park. 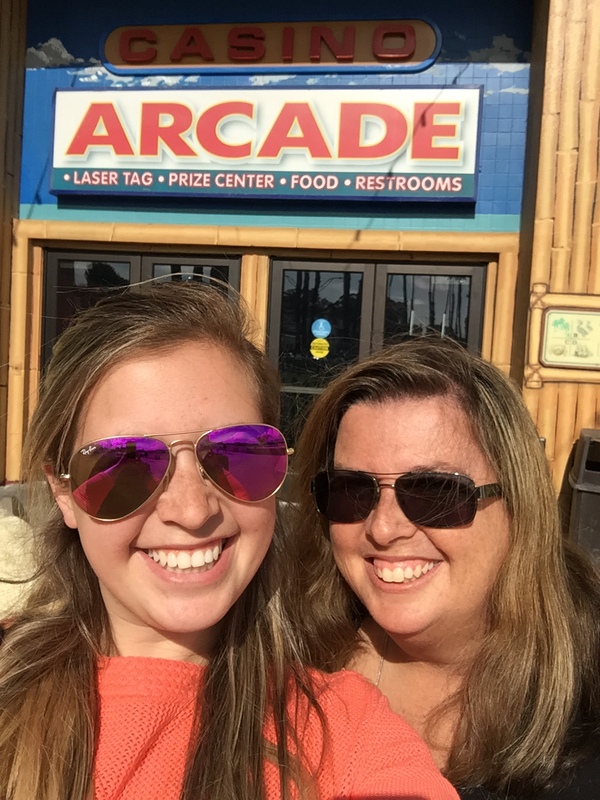 We had so much fun riding rides and playing arcade games – total kids but so many laughs! From Santa Cruz we had to continue driving that afternoon down to Monterey where we would be spending our first night. We made the decision to book hotels before we went which committed us to particular cities/towns on particular nights and meant that we had to drive certain distances each day. Whilst there were times on the road that I think we may have liked to change that, all in all, I think it was a good idea for us to book ahead because we needed to travel those distances in order to make it to LA by Friday. It also took the stress of finding somewhere when we got there away. So, night one we drove to Monterey which was a really cute town – especially the Fisherman’s Wharf/Cannery Row where we headed down to for dinner. 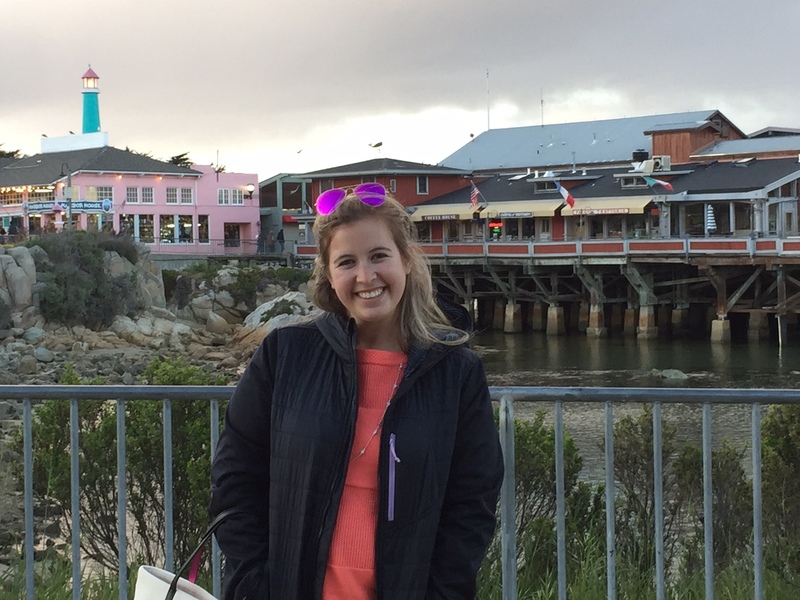 If you find yourself in Monterey, this area is definitely not to be missed – it’s basically the postcard picture of the quintessential fishing town and is full of restaurants that specialize in Seafood and are known for their Clam Chowder. I must admit, we didn’t order Chowder but the food that we had down there was fantastic – so delicious!! We enjoyed exploring Monterey but the next morning we were off again and had to leave the sweet little town behind. Our second day of driving was definitely a big one! We started off with breakfast in Carmel which is a town that looks like it could have popped straight out of a fairytale story book. Everything is sweet and little, the streets house art gallery after art gallery and accordingly have some fantastic works for visitors to view. The beach is really pretty and we had breakfast in a tiny restaurant that really looked like it could have popped straight out of a Disney story – really all too cute! After Carmel it would be a while till our next town as we headed down the coastline and drove through the Big Sur region stopping at a few national parks and many many look out points. 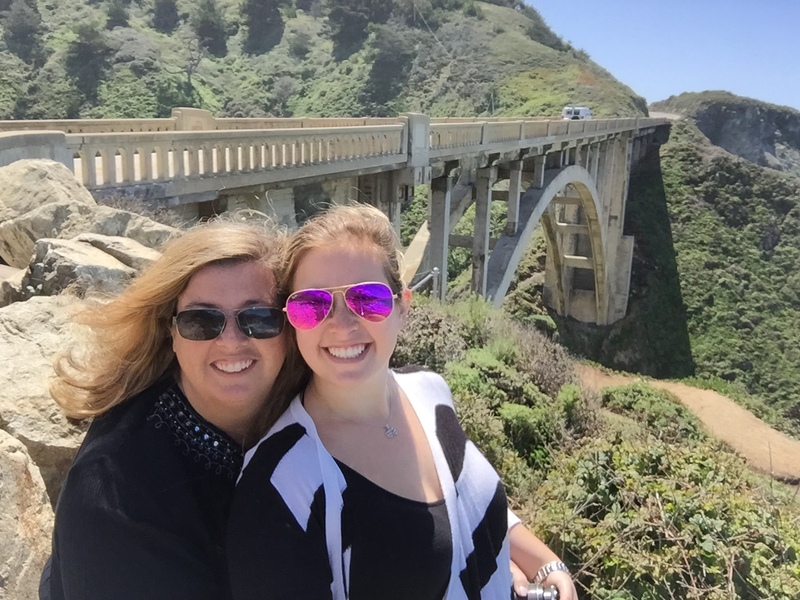 The Bixby Bridge was definitely a highlight as it was awesome to see a site so iconically Californian but really it was the jutting rocks in the endless water and the lush and dramatic mountains that had us totally in awe of the nature around us. It was amazing! Such a beautiful drive!! 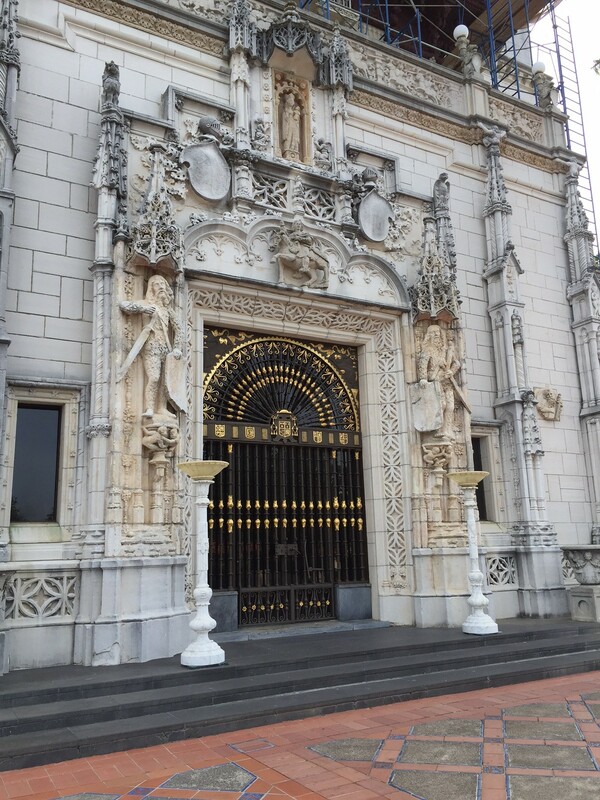 After multiple hours of driving, we eventually reached our town for the evening San Simeon – known mainly because of Hearst Castle. To be honest, with the exception of the castle, San Simeon really has nothing – it’s very close to Cambria which had a very cute little main street with lovely gift shops and many restaurants – we had a delicious dinner there! I’m sure that the beach there is beautiful but we arrived too late in the afternoon to consider heading to the beach. Cambria, however, was lovely to stroll around and San Simeon had a cute little hotel for us to stay in and an amazing display of stars at night – it’s amazing how beautiful the night sky is in places untouched by city pollution. 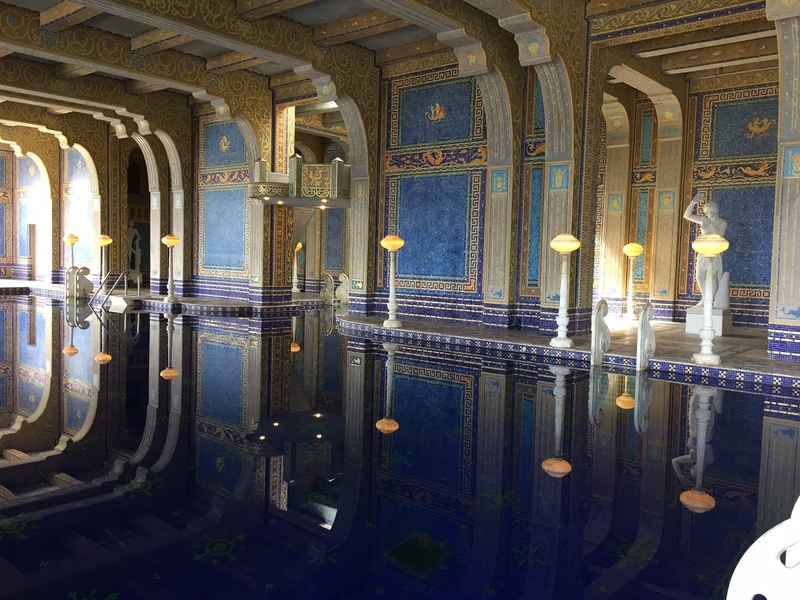 The next morning we began the day with a tour of Hearst Castle which is a definite must if you are in the area – it is so gorgeous and is so interesting to see what really looks like a little piece of Europe in the midst of the rolling Californian hills. We opted for the Grand Rooms tour but if I make it back I would really like to do the evening tour next time! From Hearst Castle we drove all the way down to Solvang which is known as the Dutch city of America. The town is so cute – it looks like it could be a Disneyworld pavilion! On our way we stopped briefly in San Louis Obispo which is definitely a larger town and looks like it has great restaurants and shopping although we didn’t experience either to really comment. We had a quick look at what may just be one of America’s most disgusting tourist attractions though – bubblegum alley. 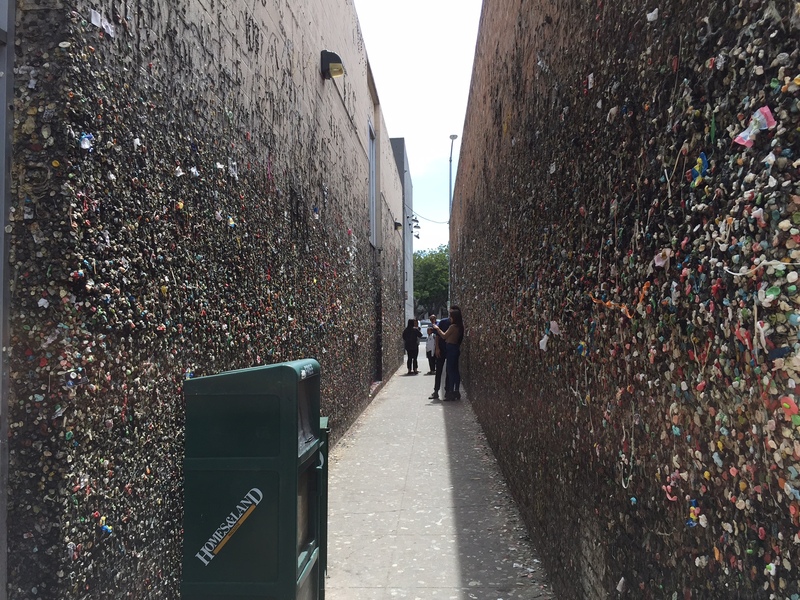 Basically, on the two long walls of one alley, tourists and locals alike go to add their mark on the town – their chewed up gum. It is really gross! 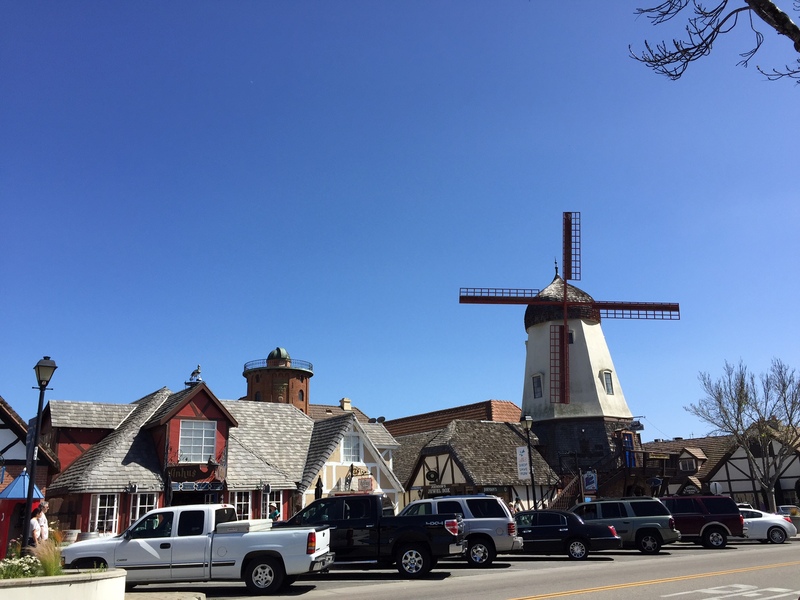 Solvang though is dotted with windmills, thatched roofs and is nearly completely void of big businesses and food chains, opting instead to support local industry. We took a tour on horse and carriage around the city so that we could learn some of the history of the city and so we were able to really see a lot. We then walked around and ate at a Dutch restaurant that is in one of the original buildings built in Solvang in 1911 and was originally the old folk school before it was converted. We also checked out the bakeries as the town is known for their pastries. Whilst Solvang requires a little detour, I would highly recommend it as an opportunity to really see something totally different to the other towns. Unfortunately from Solvang we hit our first bit of traffic and so we were unable to stop again in any other towns between Solvang and Los Angeles where we would be ending the road trip that night. Although it took much longer than anticipated, we made it to LA by Thursday night and to our hotel on Sunset Boulevard near Brentwood. Although excited to hit LA, we were sad that our Californian coastal experience had come to an end and spent much of the end of the drive researching other routes that we would like to drive in the near future having loved this road trip so much! And so, after an amazing couple weeks with my mum visiting and a fantastic road trip, I am now waiting at LAX to board my red eye flight back to DC to hopefully make it back in time for the Cherry Blossom Festival tomorrow. I just had to farewell my mum who is in the next terminal over waiting for a flight back to Sydney which was sad but I am looking forward to all the fun things I have planned between now and the end of the semester. I definitely took the opportunity this week to do something new and I absolutely loved it! As I mentioned at the end of my last blog, this week I was expecting a visitor My mum flew in from Australia on Monday night which was really exciting! 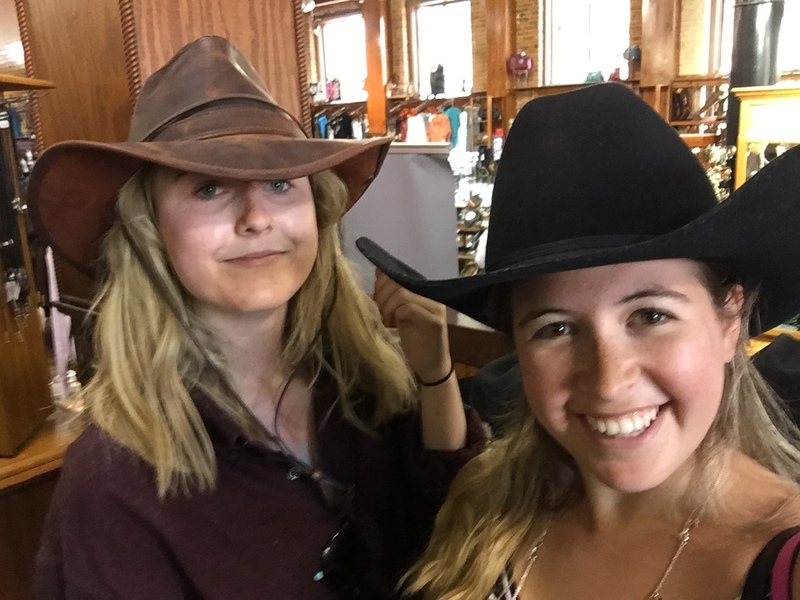 I decided that this week’s blog would be a written guide of the tour I gave to her so that you can have a bit of a sense of what you are arriving into – a ‘know before you go’ in a sense from a fellow exchange student. On Tuesday morning we did a lap of campus as I was eager to show her as much as possible – so I’m going to try and describe my walking tour and give you as much information on campus as I can. You will be taken on a campus tour during Orientation Week but it’s a lot to take in in one hit and for Spring Semester students, you will be walking through the snow most likely so if you are anything like me, concentrating and freezing are not two activities you will be able to do simultaneously. We entered campus from Georgetown so our town begins up near City Hall – this is one of the on-campus accommodation blocks that you may be placed in to live. Whilst all dorms are different, I believe city hall has a number of 2 person share rooms and each have a living room, bedroom, bathroom and kitchen (or at least the apartments that I’ve seen do). City Hall is definitely in a good position – it’s the closest building to Georgetown and is just behind the metro station and Wholefoods area – but it is a bit older than the other buildings. 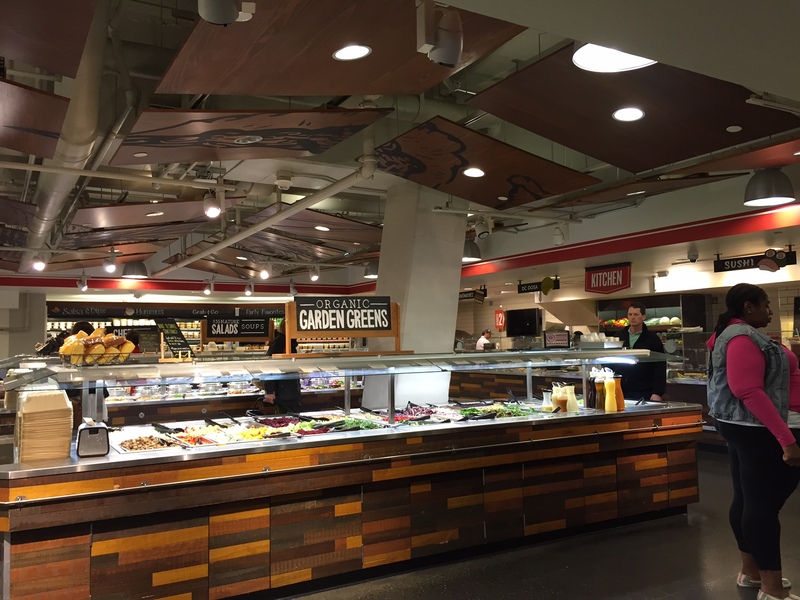 Moving on to Wholefoods and the surrounding restaurants – this is a well-frequented area for all students as it’s the spot for groceries and take away food. 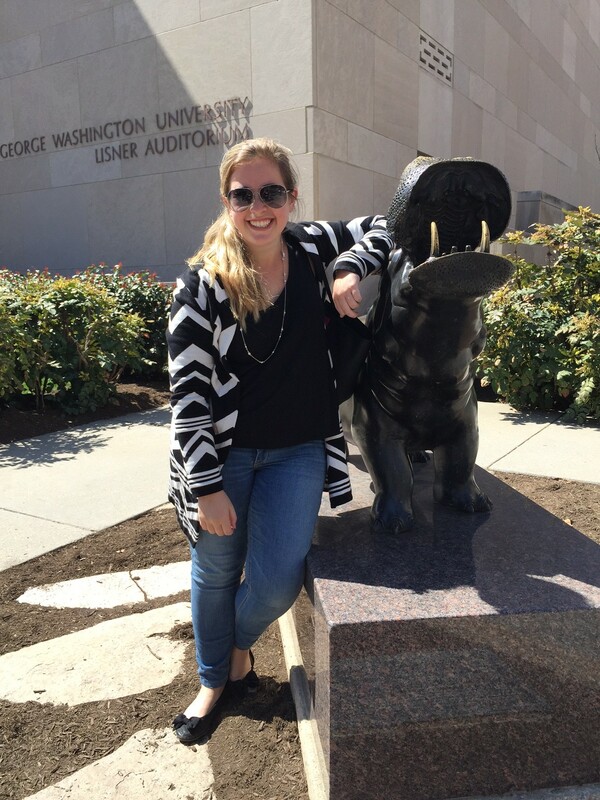 GW doesn’t have a dining hall or meal plan (there is a dining hall area but really only freshmen go there from what I understand – its called J-Street and it’s in the Marvin Centre – we will get to that in a minute). So, I think I speak for a lot of GW students when I say that Wholefoods essentially replaces a dining hall and becomes a very handy source of food when you cannot be bothered to cook. Around the back of the block with all of this on it is also a burger place in case that tickles your fancy more. Continuing on from that area – to your right you will see the beginnings of the major classroom buildings. To give an idea of where each of the buildings is in writing is not going to be an interesting read so I’m going to leave the topic of classrooms by saying, they’re easy to find and everyone is friendly so will happily point you in the right direction. The only thing that can be a bit tricky is that what looks like one building has multiple names depending on the entrance – again, just ask – someone will help you undoubtably. Majority of the classrooms are within the main blocks of campus too so it’s not too challenging. 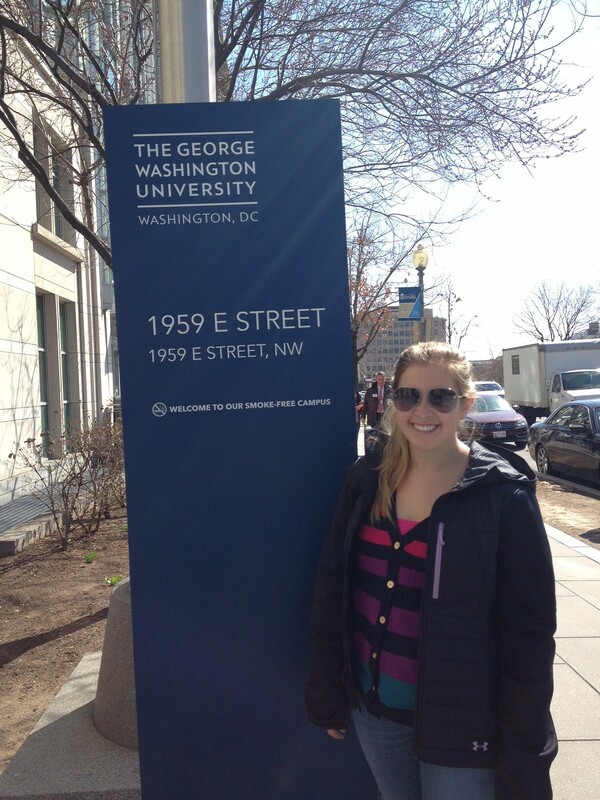 The K street rooms are a bit beyond the square that GW fits within, as is the G street block. I have a class in G Street and I think that it would be a good piece of advice to suggest that if possible, if you are taking a class in this building, try and leave yourself time between classes to get there – I have 10 mintues to get from Phillips (which is opposite Wholefoods) to G street and even though its only a few blocks, my first class rarely lets out exactly on time making the walk a very quick one! Just something to be mindful of if you can. Also, when they say on the schedule that you need to leave half an hour between classes on main campus and on the Vern, they are not exaggerating. You will need to take the free shuttle bus (known on campus as the VEX) and it is a fair distance – this is important to note as otherwise you will miss the beginning of every class! Okay, back on my walking tour…so from Wholefoods, when you turn right and head down past the Phillips building, and then left again, you will find yourself across the road from Gelman Starbucks – rumor has it that this Starbucks is the second most frequented in America. Whether or not this is true, I’m not too sure, but there is always a long line in there irrespective of the time of day. 1. The line moves pretty quickly so if you have the time, you will make it to the front eventually . 2. NEVER try go to Starbucks on the hour or half hour that a class ends – try and go at obscure times – this is a good rule for most food places on campus. By going 15 minutes earlier, you will save yourself HEAPS of time in lines! 3. The food court in the Marvin Centre has some coffee shops – one even sells starbucks blend coffee so if you can’t wait at Gelman Starbucks, cross the road and head in there. 4. 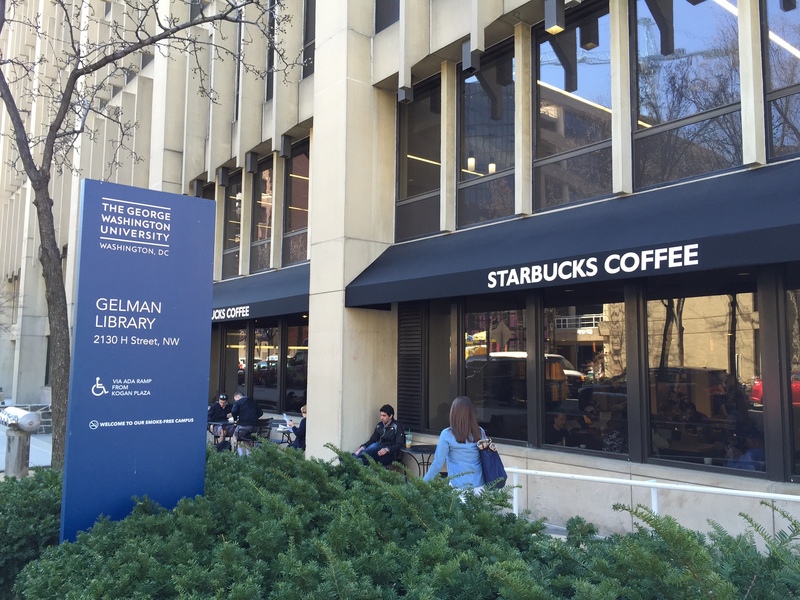 There is another Starbucks on E Street next to the E street dorms and near the Elliott School – there is often a line there too but it’s a lot more reasonable than the one at Gelman! Who would have thought getting your morning coffee could be such an art! – The ISO which is the International Office where you need to check in (visa requirement – don’t worry, you will do this in Orientation Week) and where you need to get your visa signed if you want to travel out of America (this includes Canada and Mexico – cant tell you how many times I have heard that question asked!) suggestion: take this to be signed by the ISO in Week 1 of your time at GW – you will thank yourself later when you have forgotten all about it and have to rush to get it done – they take 10 days to do it so leave yourself time or you will have to cancel your trip. Okay – so the Marvin Centre is a great resource and is in a really important area of campus. Across the road you will find CVS which is backed by the Village Shopping Centre – a small centre with some food venues, clothes shops, the UPS store, etc. CVS will be your go to store – most things that you need can be purchased at CVS. We are back tracking here, past some great sculptures – for example Martha (the hippo) – I’m going to leave the hippo stories at that and challenge you to try and work out the significance of the hippo for yourself – and many many heads of George Washington sporadically found around campus. 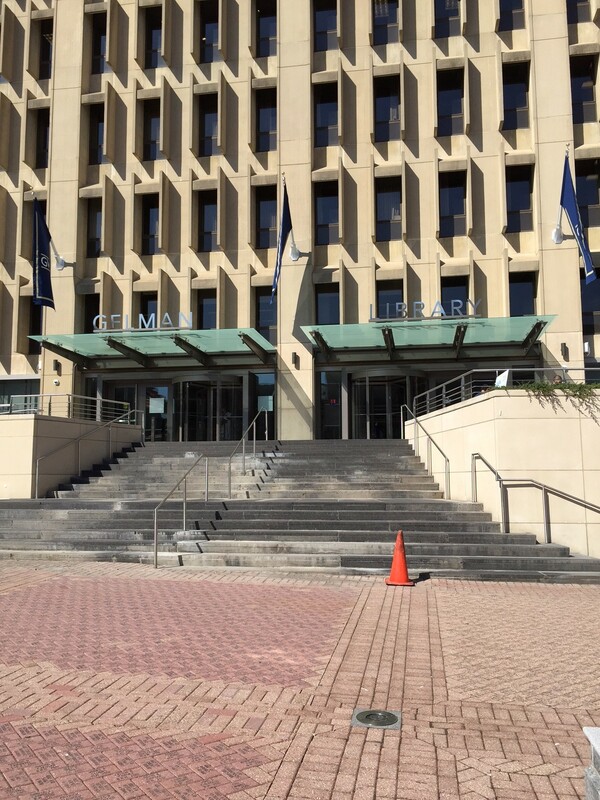 So, as we walk back past the side of the Marvin Centre, back towards Starbucks, you will find one of the entrances into Kogan Plaza which is just an open area that has the back of the Lisner Auditorium, the entrance to Gelman (the library), a nice courtyard and the creepiest statue of George Washington known to man. There is a life-like sculpture on a bench that, when you leave the library in the dark late at night, will undoubtedly give you a heart attack every single time. The Gelman library is obviously another good resource – it has plenty of study space when your dorm is too noisy, printers, computers, books, etc – everything you expect to find in a library. The staff are really friendly and are always more than happy to help if you cant find something – which you likely wont be able to because the books are everywhere! Not in a chaotic sense, just in the sheer volume of them! Behind the library is Duques – one of the big classroom buildings, which is backed onto by Funger – the business school. I am mentioning this school in particular because the VEX goes from out the front of Fungar so if you have classes or accommodation on the Mount Vernon campus, this will be an important stop to you. Opposite from there is the GW Deli which has delicious bagels but also often has an insanely long line – again, don’t go just as classes let out unless you really enjoy standing in lines. At the end of the street where the Deli is, is Tonic – a restaurant that is popular amongst students because of their tater tots (potato gems). They have Happy Hour (which seems to be nearly as popular as brunch in DC – everyone goes out for Brunch or Happy Hour) where they have $4 tots – this seems to attract a lot of people and substantial lines. They are delicious though. As we continue our walk towards E Street (which will be our final destination), you will pass the mail centre (one block down and to the left from Tonic) which is where all your packages will come in, and on top of that is the key depot – which is where you will get your keys (not if you live in E Street as your GWorld card is your key) and your mail box codes as your letters will still arrive to your building. Next door is Carvings which has burgers, fries, mozerella sticks, sandwiches, breakfast, etc – it’s open late at night making it a popular stop for lots of students! Finally, as you turn right at the end of the street and walk back the old main building (where the ISO is), subway and then the Starbucks on the corner, you have reached E Street! This is another dorm that has many exchange students in it this semester – it’s where I live – and despite being a little further down from the rest, is a much newer and in my opinion nicer building. We are next door to the Elliott School too for students taking international relations, etc. I skipped talking about the other two buildings that you will mainly find exchange students in because we didn’t take that road – But Shenkmen (formerly Ivory – just so that you don’t get confused when people still call it Ivory) and Amsterdam are also nice and are in good locations. Near Shenkmen is also the sport centre where you will go to watch basketball games, etc. And the HellWell (Health and Wellness Centre is up in that area too). Final note – up 20th Street – the street that E Street dorms corner, if you walk up toward to the Village shops (where CVS is on the other side) you will find Founding Farmers – personal favorite for brunch and lunch – so delicious! But I will do another blog about DC recommendations for when you get here . I hope that this has been in some way helpful in giving you a bit of a blue print on what to expect when you get here and where to find particular things. As I mentioned, everyone is very friendly and will happily point you in the right direction. 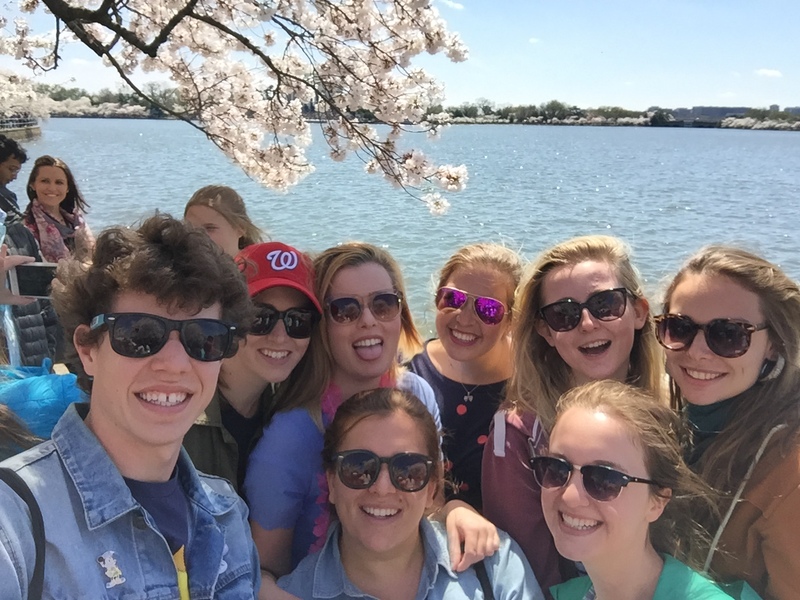 The nice thing about the GW campus is that it is very easy to get to know – you may feel lost for the first week but you will definitely get the hang of it after that! I wanted to take some more photos but I am currently in Vegas for the weekend with my mum and so whilst there are some photos here for you, I will definitely try and post some more later on. Why is this week different from any other week? The first weekend of April reunites families and communities all over the world. Doesn’t matter if you celebrate Eastern or Pesach, last weekend most of us shared a nice meal with our families. Back home, an almost in every country, the first two nights of Passover are the ones we tend to get together with family and friends to celebrate the freedom of our people. Our traditions and costumes remain in almost every home I know but some differences are easily distinguished. 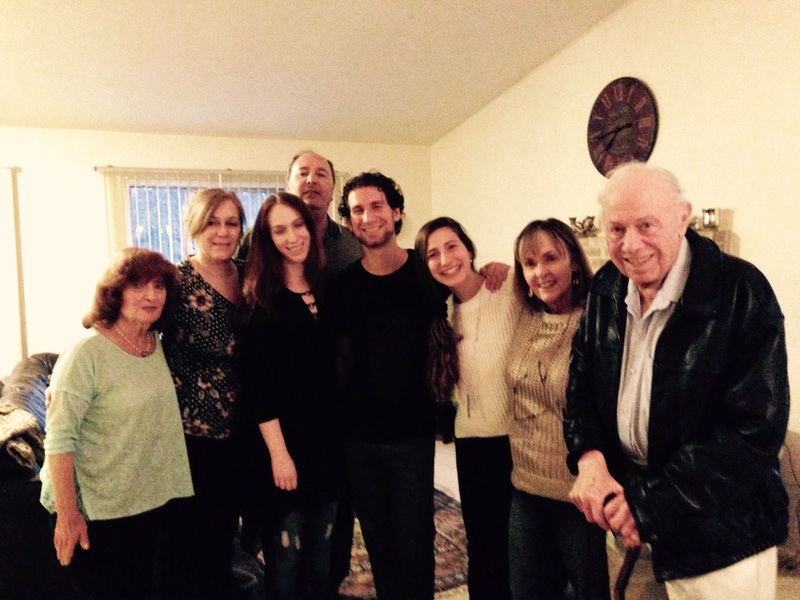 This was the first time I spent Passover without my parents or first cousins, and of course not in Argentina, but I must say it had it’s own charming characteristics. On Friday evening, my brother and I decided to attend the Seder of the Hillel community that was taking place in Marvin Center. After a last minute call, and if adding two persons to a dinner were too easy, they openly accepted our request of joining them for the first night of Passover. When we finally arrived, some faces were too familiar and people that I share classes with received me with a warm Jag Sameaj (Happy Holiday) Before the seder began, we sat in a table with 5 different people that lately that night were going to became our friends. The Rabbi made the whole Seder an interesting and not boring celebration. Trying to analyze some topics that were also related to modern times plus the melodies sang or recited by each table (we were almost 100 people) made the ceremony absolutely pleasant. After some laughs, good food and religious traditions, my first day without flour made me go to sleep with a huge smile in my face. The next day my brother and I travelled to my relative’s house near Gaithersburg. This second dinner was not only special because I was with family but also because I got the chance to spend it with the Patriarch of my family, the one that would not hesitate in explaining to me the history and complicated family tree that I have. As if everything happened yesterday, he can totally remember every dialog, trip and connection that started with his grandmother and my great great-grandfather. After listening to him and having just the idea of every problem that my ancestors had to overcome, makes me realize how lucky we are of having the power of communication on our side. Apart from that, another wonderful thing made me happy that night; my aunt, who is an artist, did a painting of me and gave it to me as a present. I was not the youngest one and I didn’t look for the Afikoman (another tradition we have) but I was at that point the kid that received a gift. I couldn’t be happier, it was a fantastic surprise and I can’t wait to have the fantastic painting in my room. The food that my cousin prepared was also fantastic and I was finally eating this typical Jewish homemade food that made me feel at home. We did the brajot, sang some of our traditional songs and read the interpretation of each of those. Even if we were a modern family that read the Hagada from an Ipad, we remembered the most important question/answer of this special festivity: Why is this night different from any other night? Freedom, that is what we celebrate this week. Freedom. The night ended with a nice talk about each other’s near future and recent changes in our lives, with the dog’s ability to lock herself inside a room and the invitation to meet again the following week. Last Saturday I also went to Spring Fling with my friends. Free tickets for a show, The Mechanic Shark, Sno-Kones, stickers and shiny tattoos were some of the attractions of that day. This festival organized by members of the University was not only an afternoon full of games and prizes but also full of music, famous DJ’s and food; perfect to celebrate with friends. 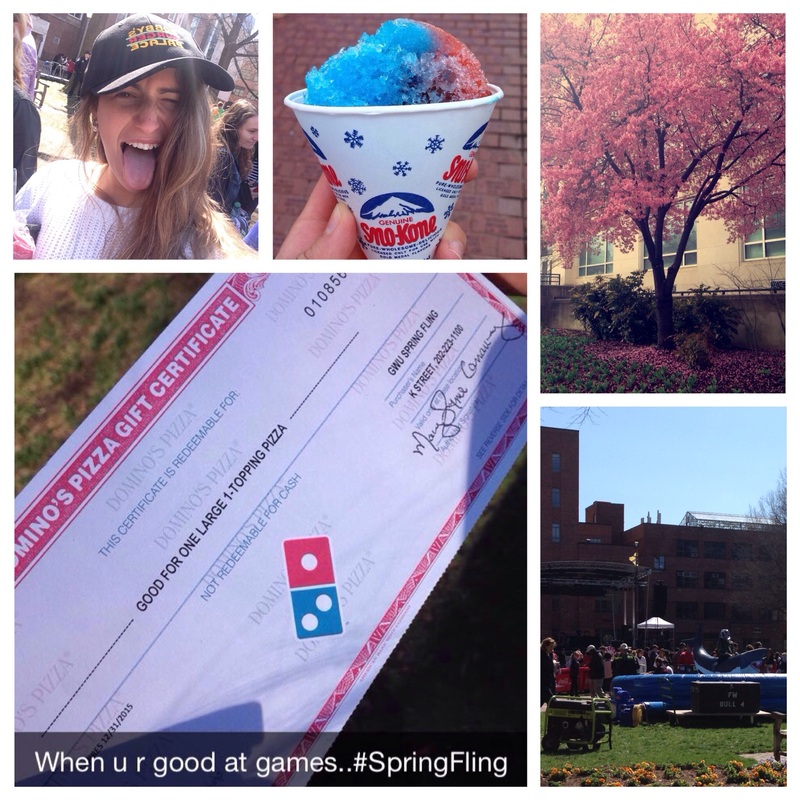 The U Yard was surrounded of students playing the roulette or even uploading selfies to win special gifts. In my case, implied a Domino’s large pizza that I’ll happily eat to break my no-flour week. Also, Saturday was a really warm day that reminded us the main reason why we where there: Spring. I believe most people was not as happy to receive the flowers, the green grass or the allergies as much as they were of saying goodbye to the snow, the storm and the freezing cold weather. If you think it that way, then yes, celebrate the change of seasons with your friends has never been better. This huge event ended with a beautiful sunset and the feeling and desire to repeat that day one more time. 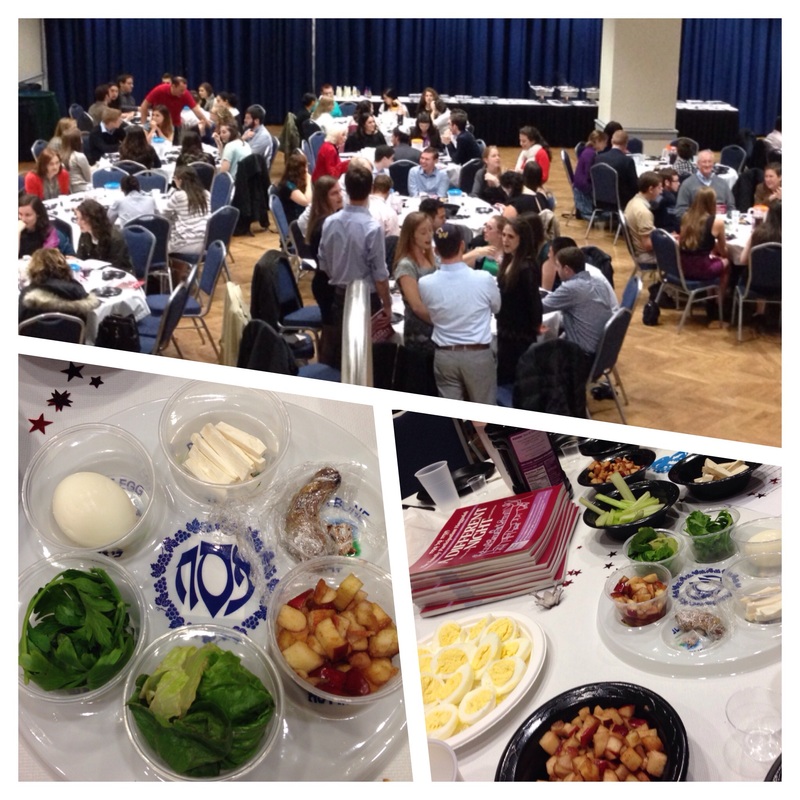 Filed under Uncategorized and tagged DC, Exchange, GW, Ilanit, Learning @ GW, Life @ GW, Living @ GW |	Comments Off on Why is this week different from any other week?